According to Gartner, chatbots are rapidly entering in enterprises. More than half – 52% of enterprises have already developed and started using chat bots and bots for their daily purpose tasks. Bots revolutionize user’s experience to deal with an intranet, extranet or public facing solution. When chatbots are such rapidly emerging the market and apprehending industry hype with broader appeal for users, then why can’t they affiliate with SharePoint Development for enterprise system? It surely commences a better path of interaction for employees with enterprise systems. Microsoft SharePoint Development is opted mainly to fathom complicated collaboration quandaries of enterprises. With SharePoint intranet or extranet solution, the challenges are resolved, but still, 40% of organizations face issues of low adoption rates of the software solution. To deal with this, many successful intranets and extranets have adopted a technique of integrating intelligent chatbot. Bot foster bonds with humans by swiftly fetching user-specific content. As Bots are precisely aware of with whom they are conversing, so accurate information is obvious. After integration and configuring bot with SharePoint Enterprise solution, a user can access information of site without logging in or opening the site. If SMS service is integrated with intranet, then users can even interact with the bot in offline mode. To fetch information from SharePoint site, add custom logic using REST API, CSOM, etc. Let’s deep dive in several sample scenarios where chatbots can be integrated to leverage the activities by just chatting with a bot or commanding a bot. Search for users, documents, sites, contacts directly from SharePoint search with the bot. Add task, view pending task and approve it from the bot. Even, the task can directly be assigned to other users directly, through bot. An employee can update leave or work logs by letting it known to chatbot. Bot can help in searching the documents of Document Library. Even documents can be downloaded and uploaded directly from bot. Get notified regarding workflow and even approve it through bot. Bots can send quick notifications for upcoming events by referring calendar. Bots acting as reminders. Chatbots send pop-up messages for updates, news, announcements and much more. Intranet has pull feature by default. 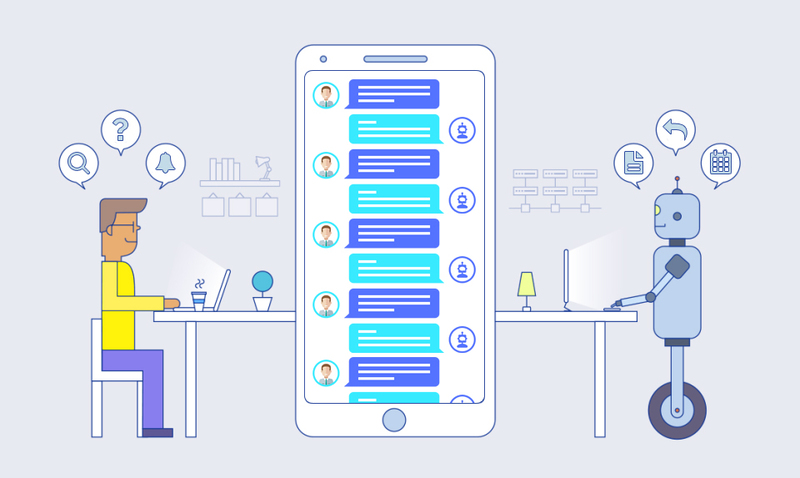 It can be leverage will chatbot by providing the brilliant user experience. Bots answer quickly to user’s questions and additionally suggests user to have a look on other available data (Relevant Suggestions). Integrating bots with SharePoint make an employee work more prolific and highly effective as they can access desired information in just a few texts. With boosting the intranet and extranet adoption rates, bot ease woes by swiftly accomplishing time-consuming activities in an interactive manner.